Lhote was born in Bordeaux, France in 1885. He left grade school at age thirteen to become an apprentice at a local sculpture studio while formally studying sculpture at l’École des Beaux Arts. Lhote supported himself by repairing antiquities and giving drawing lessons. At age twenty, in order to devote himself to painting, he set up a studio in the attic of an old house in Bordeaux. In those days, Lhote often visited the home of collector Gabriel Frizeau. It was here that he met among others, Jacques Riviére the literary critic of Nouvelle Revue Français, who took a great interest in painting. ibit a sense of rhythmic gesture, simplification of shapes, and intense color. Several of these works are illustrated in Jacovsky’s André Lhote. The Cézanne Retrospective in the Salon d’Automne of 1907 profoundly affected Lhote’s development. In 1908 the Groupe du Bateau-Lavoir was formed, of which Lhote was an early member. This was the original Montmartre Cubist Society, so named, for the tenement in which Picasso was living. In 1910, Lhote's work was exhibited at the Salon des Indépendants, the official launching of the Cubist movement in Paris. The response to his paintings was so favorable that he was soon offered his first solo exhibition at the Galerie Druet. Critics, contemporaries, and writers in Paris such as André Gide, André Salmon, and others contributed their full support to Lhote at this time. Following this triumph, his work was exhibited at the Salon in 1911 and 1912 with the major Cubists of the era. Lhote soon joined the independent Cubist group Section d’Or along fellow pioneers Albert Gleizes, Jean Metzinger, Fernad Léger, Francis Picabia, Frans Kupka, Juan Gris, and Alexander Archipenko. 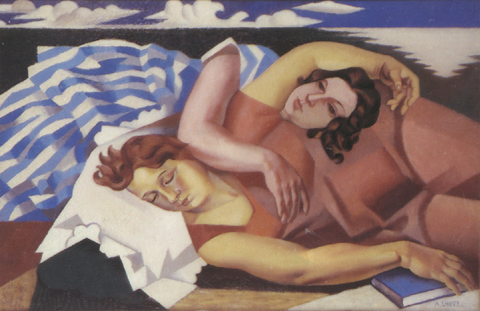 Lhote contributed to the development of Synthetic Cubism in his writings as well as with his paintings. He often defended his ideas in Nouvelle Revue Française. Indeed, Robert Rosenblum in his Cubism and the Twentieth century Art has called Lhote “the official academician of Cubism.”Lhote’s publications are numerous and include the important monographs on Corot and Seurat, Traité de la Figure et du Paysage, and Chefs d’Oeuvres de la Peintre Égyptienne.He also contributed to the French and foreign journals throughout his life. His illustrations appear with the writings of Jean Cocteau, Paul Eluard, François Mauiac, and Blaise Cendrars. Lhote was a dedicated teacher for decades, his style and technique was passed on to hundreds of young artists that flocked to Pairs. From Tamara de Lempicka, his most famous student to a mass of yet overlooked artists, his contribution to Modern Art in incalculable. André Lhote has been honored in France on a number of occasions. He was awarded the National Grand Prize of Painting in 1955 and was honored in 1958 as Commander of the Order of Arts and Letters. Retrospectives of Lhote’s work were held at the Musée d’Art Moderne in Paris in 1958, and at the Musée Toulouse Lautrec in Albi, 1962, the year of his death. His paintings are in museum collections throughout the world.